A Rolling Stone . . . .
Several weeks ago, I showed some photos of the Grape Crush series of kitchen towels. 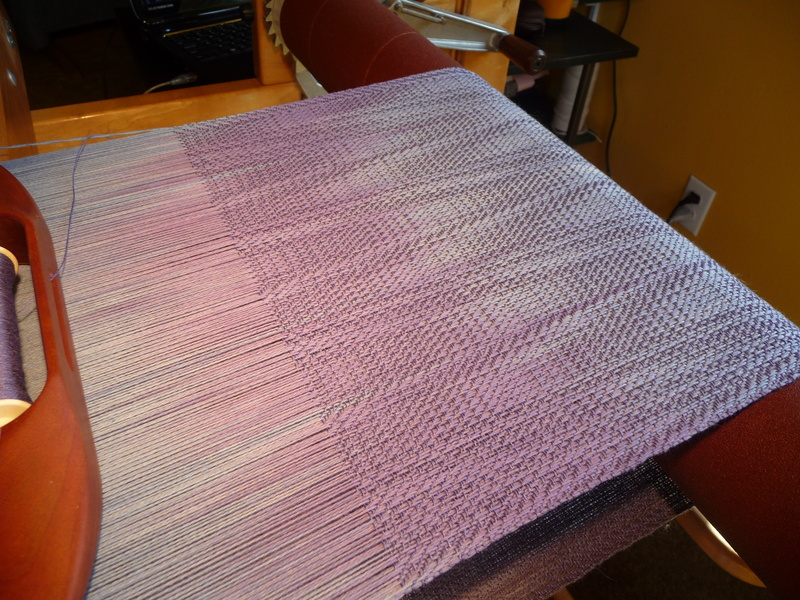 Before they were even off the loom, some were sold, and now they all are — except for the one I’m keeping for myself (first time ever). Some are off to Colorado, a couple to Hawaii, and the rest will stay here on Whidbey Island. 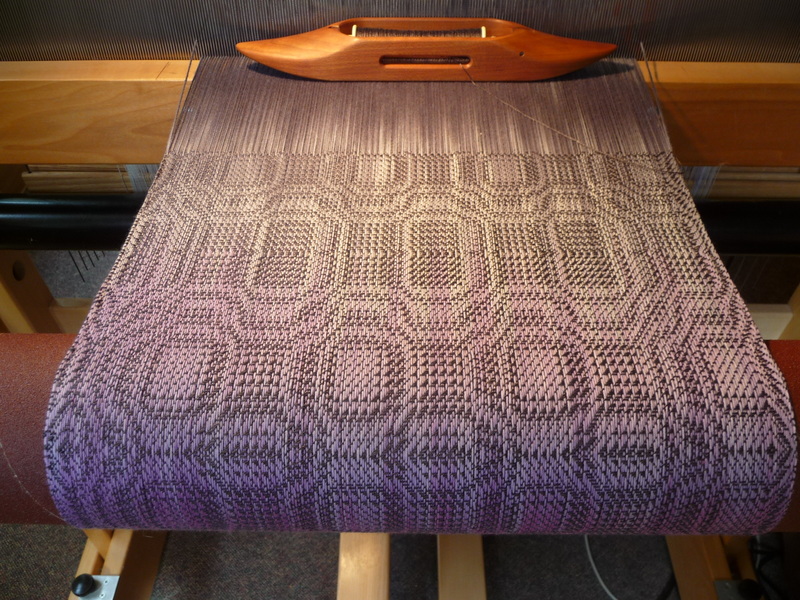 Keep in mind that these views are deceptive — I used a 12.5-yard-long hand-painted warp, where the colors kept shifting along its length. Shades of grey, lavender, pale to soft blue, and a riveting magenta — all blending into one another almost randomly and quite unpredictably. 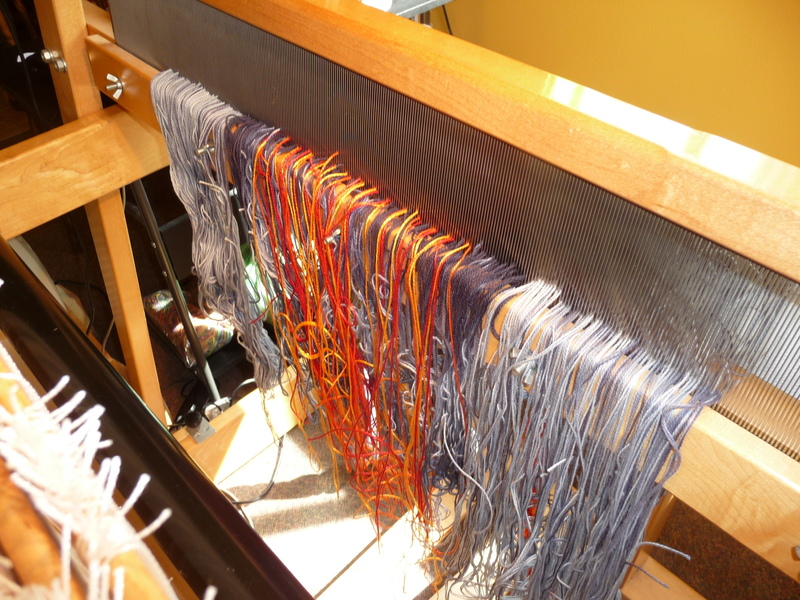 Made the weaving of such a long warp interesting right to the end, often a problem for me because of the likelihood of getting bored. 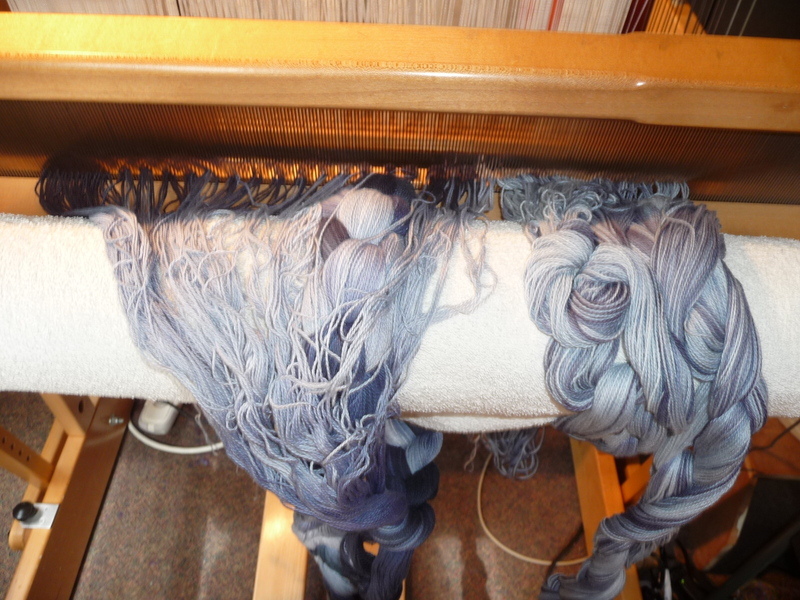 The warp was a very soft fine cotton, and the weft yarns were either bamboo or tencel, giving the finished scarves a lovely lustrous glow. One is sold; the rest will be available at my Open Studio on Saturday April 11. 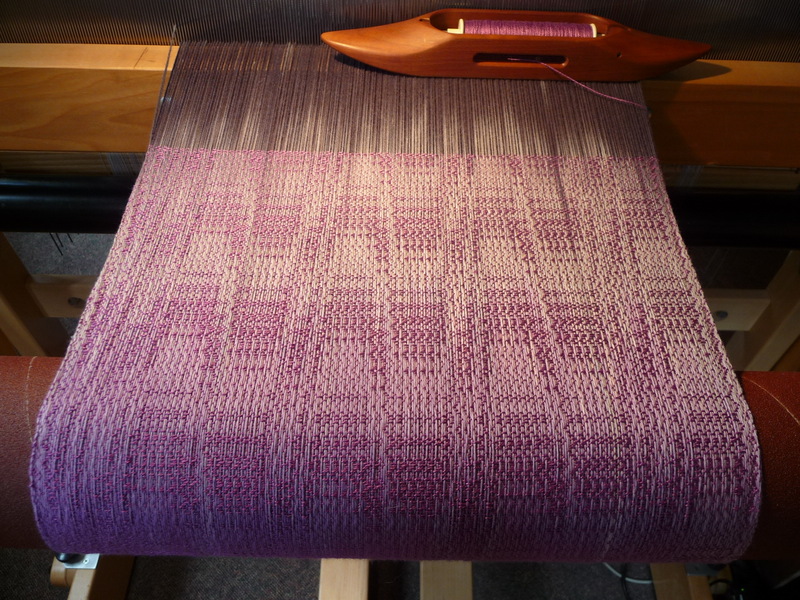 One of the elements of my 2015 Work Plan is to weave during the year four series of “seasonal” Designer Towels for the kitchen (aka Art For the Kitchen). 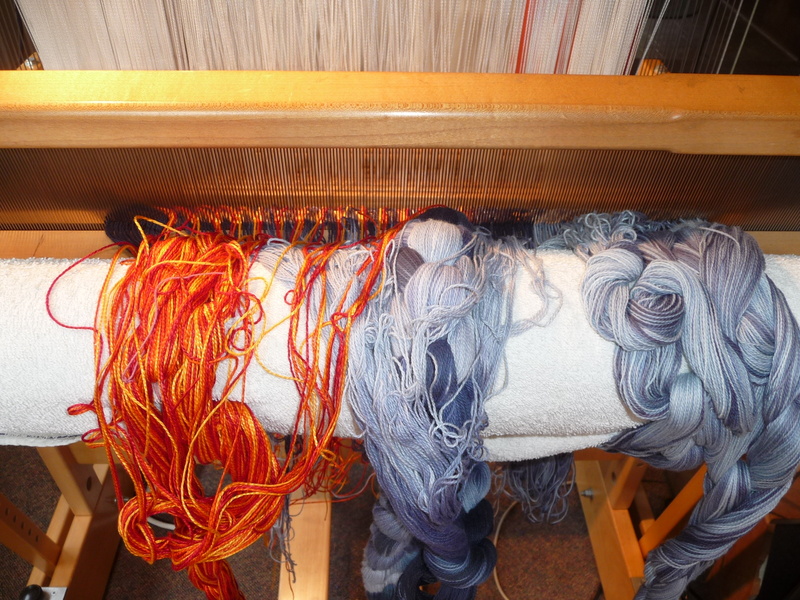 The winter group is going onto the loom this week, and will be well into the weaving process on Saturday for those who want to see all the action. It’s called “Midwinter Fire”, named for a wonderful ornamental shrub (of which I have no photos from this garden) called Cornus sanguinea ‘Midwinter Fire’. It’s a type of red-barked Dogwood, very shrubby, with stunning red/orange/gold stems that show up beautifully in the grey wintertime here in the Maritime Northwest. If you want to see what it looks like, it’s easy to find on the interwebs. 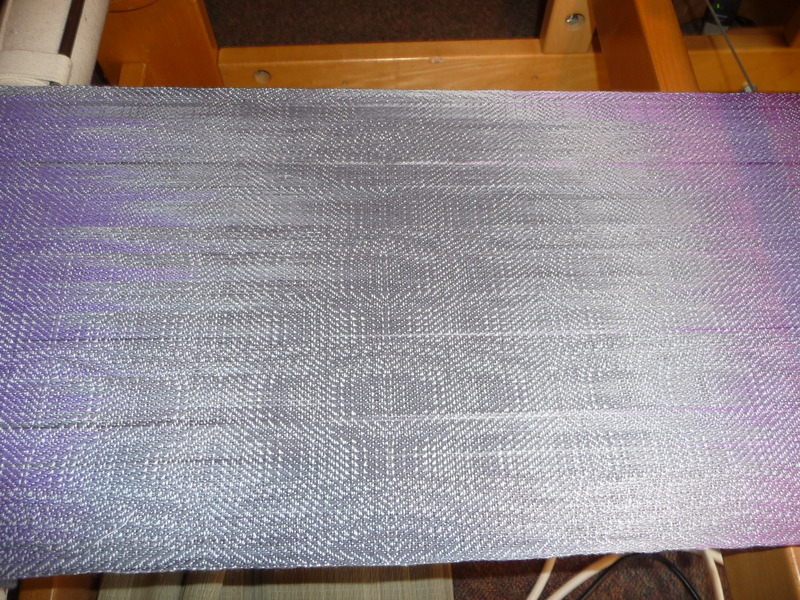 That’s 481 threads across; I’ve begun the threading, a complex pattern I designed just for this project. It’s going very slowly, but will be well worth the effort. I promise. Looks like a hopeless damn tangle! 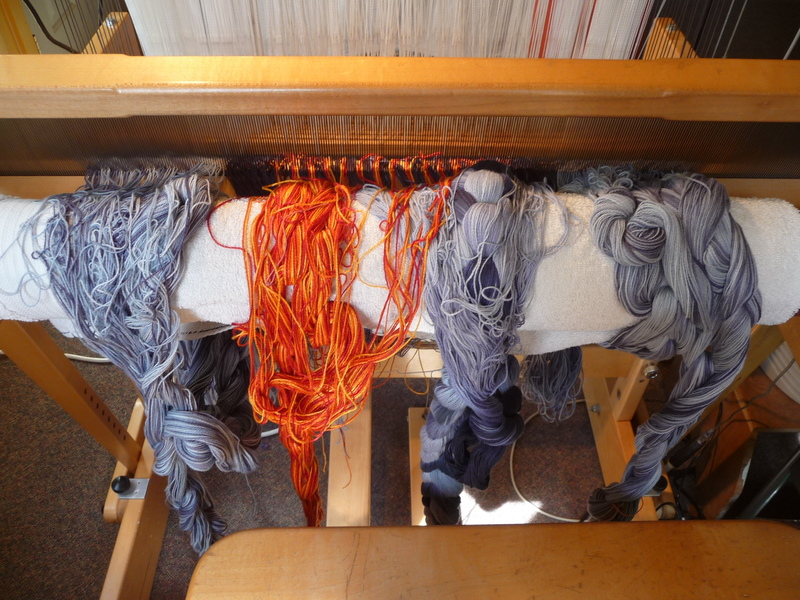 I’m impressed that anyone, especially someone related to me, would have the patience to make sense of it all… not to mention (OK, so I’m mentioning it) turn it into something so beautiful! You are turning out mountains of classy, intricate, and yummy work. Can’t wait to get home so I can touch and see it live. Oh my, what a stunning conflagration of color! Clever of you, my dear! Took me a minute to catch it.